August 3, 2018 - New Yorker Electronics is now distributing the new Barker Microfarad (BMI) 800P and 810P AC Motor Run Capacitors. 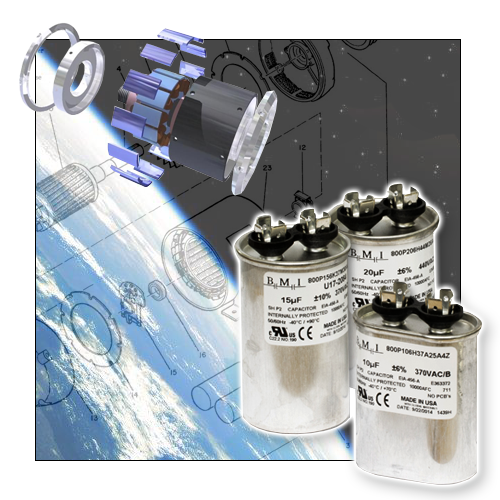 These units are non-polarized oil-filled metalized polypropylene film capacitors designed for continuous AC applications. A ¼in Quadruple Quick Connect Terminal is standard but a ¼in Triple Quick Connect is also available, as are ¼in combinations of double, triple and quadruple terminals and ¼in Solder Lug Quick Connect Terminals. Mounting hardware and brackets are available to facilitate mounting. Units can be supplied with bleeder resistors if required. New Yorker Electronics is a franchise distributor of Barker Microfarad and supplies its full line of AC Motor Run Capacitors, AC Motor Start Capacitors, Military Spec Capacitors, Mini Axial Capacitors, Mini Radial Capacitors, Tubular Axial Capacitors and Tubular Radial Capacitors.